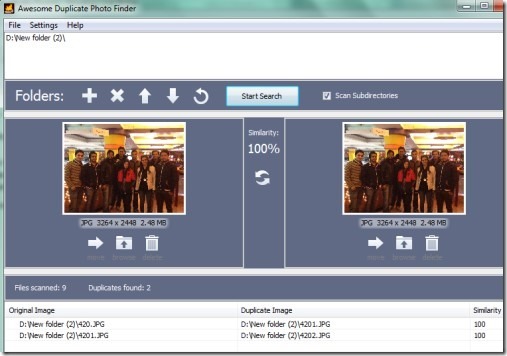 Awesome Duplicate Photo Finder is a free software for Windows that is used for finding and removing duplicate photos from your computer. It supports drag n drop facility to add whole folder or directory to start searching for duplicate files. After completing the search, you can remove duplicate photos easily to save disk space. Not only duplicate photos, it also lets you search for similar photos and shows you the similarity (in percentage) between photos that look-alike. It can scan photos of bmp, png, jpg, tiff, and gif format. This Awesome Duplicate Photo Finder is available free of cost for Windows and is very lightweight in size (less than 2 MB). How To Use This Software For Removing Duplicate Photos? On its interface, you can add multiple folders containing your images. You can either drag n drop folders or can use plus button to add folders. All the added folders you will find at top part on its interface. You can arrange these folders (move up or down) using available buttons. After that, you need to hit on the Start Search button and it will start scanning those folders. 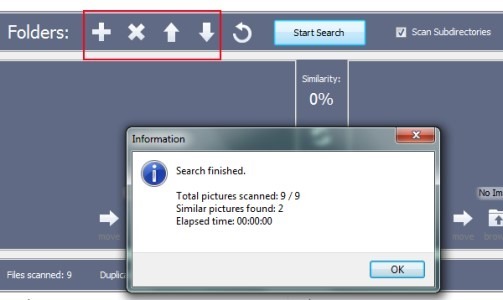 Within a few seconds, it will show you scanned results and you can take action for duplicate or similar looking photos. You can move duplicate photos either to a new location or can simply hit the delete icon to move those images to recycle bin. This is an easy way to find and delete photos that are similar or exactly duplicate. Other than this, you can access settings to adjust delete options, search options, and to enable/disable automatic updates of this software. Awesome Duplicate Photo Finder is a good software and lets you remove duplicate as well as similar looking photos. You can save a bit of disk space if there are multiple duplicate photos present and you want to remove them. Download it by clicking on the link present below.